Bangkok is known for historic sites, shopping, nightlife, spas, and nature. Your plan includes some of its best attractions: explore the historical opulence of The Grand Palace, shop like a local with Chatuchak Weekend Market, look for gifts at Rajawongse Clothier, and contemplate in the serene atmosphere at Temple of Dawn (Wat Arun). 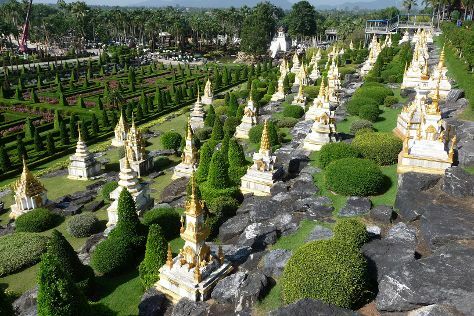 To see photos, other places to visit, more things to do, and more tourist information, go to the Bangkok road trip site . Bilbao, Spain to Bangkok is an approximately 18.5-hour combination of flight and train. You can also do a combination of bus, flight, and train. The time zone changes from Central European Time to Indochina Time, which is usually a 6 hour difference. Plan for somewhat warmer temperatures traveling from Bilbao in July, with highs in Bangkok at 39°C and lows at 30°C. Wrap up your sightseeing on the 14th (Sat) to allow time to drive to Khao Yai National Park. 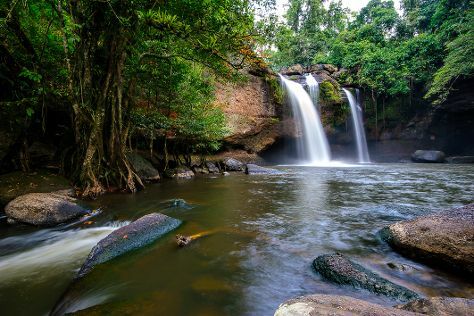 On the 15th (Sun), explore the wealth of natural beauty at Khao Yai National Park. Get ready for a full day of sightseeing on the 16th (Mon): take in the dramatic scenery at Haew Narok Waterfall and then get outside with Khao Yai Bird Watching Day Trip by Thailand Bird Watching. To find other places to visit, where to stay, reviews, and more tourist information, you can read our Khao Yai National Park trip itinerary maker website . You can drive from Bangkok to Khao Yai National Park in 3 hours. Other options are to do a combination of train and taxi; or do a combination of bus and taxi. In July, plan for daily highs up to 39°C, and evening lows to 30°C. Finish up your sightseeing early on the 16th (Mon) so you can go by car to Pattaya. Start off your visit on the 17th (Tue): don't miss a visit to Walking Street Pattaya, admire nature's wide array of creatures at Underwater World Pattaya, then take in nature's colorful creations at Nong Nooch Tropical Botanical Garden, and finally make a trip to Sanctuary of Truth (Prasat Sut Ja-Tum). On the 18th (Wed), you'll have a packed day of sightseeing: tour the pleasant surroundings at Jomtien Beach, then buy something for everyone on your list at CentralFestival Pattaya Beach, and then look for gifts at Ama Fashion. For maps, traveler tips, reviews, and more tourist information, go to the Pattaya trip planner . Traveling by car from Khao Yai National Park to Pattaya takes 3.5 hours. Alternatively, you can do a combination of taxi, train, and bus; or do a combination of taxi and bus. July in Pattaya sees daily highs of 36°C and lows of 30°C at night. Finish up your sightseeing early on the 18th (Wed) so you can travel to Patong. When in Patong, make a side trip to see Phuket Big Buddha in Chalong, approximately 46 minutes away. Spend the 20th (Fri) among aquatic life with a scuba or snorkeling tour. There's still lots to do: make a trip to Patong Beach, look for gifts at Suit Master, tour the pleasant surroundings at Karon Beach, and take in the dramatic scenery at Gibbon Rehabilitation Project. To see maps and tourist information, use the Patong trip maker tool . Getting from Pattaya to Patong by combination of train, taxi, and flight takes about 3.5 hours. Other options: do a combination of bus and flight; or drive. In July, daytime highs in Patong are 36°C, while nighttime lows are 28°C. Wrap up your sightseeing on the 21st (Sat) to allow time to travel to Maret. Start off your visit on the 22nd (Sun): enjoy the sand and surf at Thong Takhian Beach (Silver Beach), stroll through Chaweng Beach, and then wander the streets of Fisherman’s Village. For where to stay, other places to visit, and other tourist information, refer to the Maret tour itinerary planner. Traveling by combination of taxi and flight from Patong to Maret takes 2 hours. Alternatively, you can do a combination of bus and taxi; or do a combination of bus and taxi. In July, daily temperatures in Maret can reach 38°C, while at night they dip to 31°C. Finish your sightseeing early on the 22nd (Sun) so you can travel to Koh Tao. Kick off your visit on the 23rd (Mon): discover the deep blue sea with a scuba or snorkeling tour. Get ready for a full day of sightseeing on the next day: enjoy the sand and surf at Sai Nuan Beach, soothe aching muscles at some of the top local wellness centers, and then kick back and relax at Ao Tanot Bay. To find other places to visit, photos, more things to do, and tourist information, go to the Koh Tao tour itinerary planner. Traveling by combination of taxi and ferry from Maret to Koh Tao takes 2.5 hours. Alternatively, you can do a combination of taxi and bus. In July in Koh Tao, expect temperatures between 38°C during the day and 31°C at night. Finish up your sightseeing early on the 24th (Tue) so you can travel to Chiang Mai. Go for a jaunt from Chiang Mai to Doi Suthep to see Wat Phra That Doi Suthep about 1h 15 min away. Spend the 25th (Wed) wandering through the wild on a nature and wildlife tour. Next up on the itinerary: explore the ancient world of Wat Chedi Luang Worawihan, contemplate in the serene atmosphere at Wat Phra Singh, admire the landmark architecture of Wat Chiang Man, and examine the collection at Museum of World Insects and Natural Wonders. To find where to stay, ratings, traveler tips, and other tourist information, you can read our Chiang Mai driving holiday planner . Do a combination of ferry and flight from Koh Tao to Chiang Mai in 5 hours. Alternatively, you can do a combination of ferry, taxi, and flight; or do a combination of ferry and train. Expect a daytime high around 38°C in July, and nighttime lows around 28°C. You will leave for home on the 28th (Sat).